Last week, I stared at a five-pound bag of Chickpea flour sitting in my baking cabinet. It cried to be opened. I immediately closed the cabinet, walked away, and within seconds, I ran back into our kitchen, opened the cabinet door, and grabbed the bag of flour off its shelf. I refused to ignore its cry. The first thing that came to my mind was my mom’s onion pakora recipe with a two-second Ketchup Chutney. Pakoras are something I grew up on. I love how how imperfect and rustic they are once out of the hot oil. And I love that they bring brightness to a dreary day. I also adore the sweet and spicy ketchup chutney served with them. Often, on rainy days, I seek comfort food. I crave savory and sweet. And I adore quick and simple. Although I’ve held back on this onion pakora recipe for a week, when these were made, I was absolutely sure that it was Spring. With the small duvet of snow that blanketed the New Jersey area yesterday morning, I am now unsure of what season it is, but I am praying that the snow and rain are not a teaser to something worse. Imagine: snow in May. That’d be interesting. Wouldn’t it? 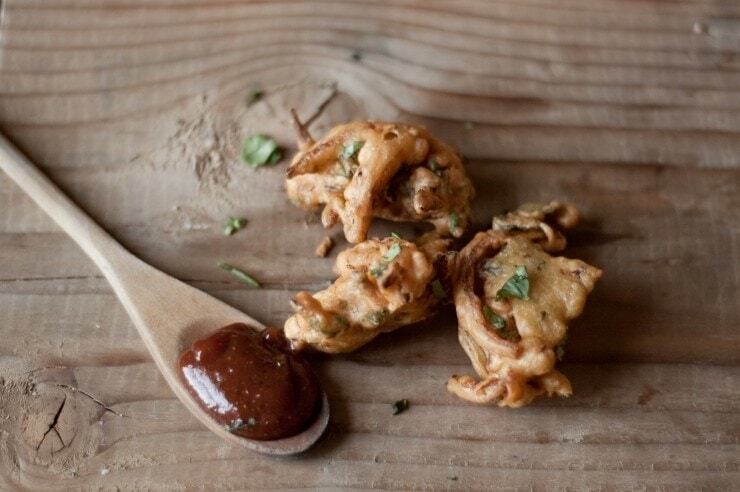 Regardless of what season Mother Nature may have placed us [back] in, these Pakoras call for your attention on any day- sunny or dreary. When the idea of making pakoras came to mind, my mother and I agreed that making them was quite necessary. You may not consider this to be dinner, but with there being only two people in our house that day, dinner it was. It’s amazing how we inherit recipes through family. 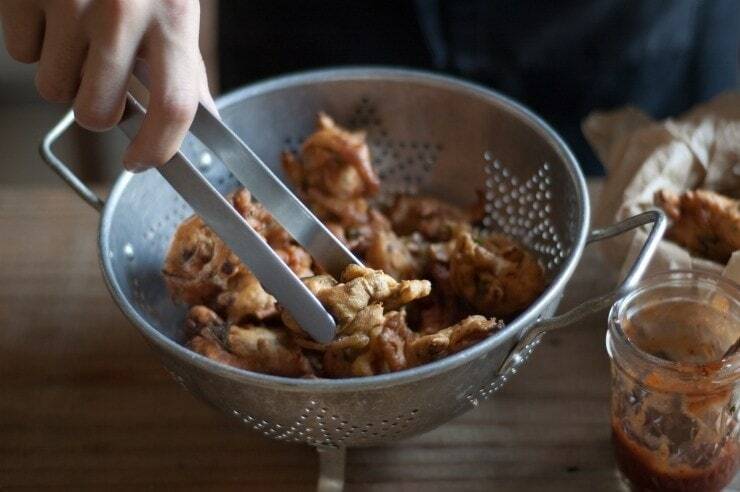 My mother inherited this recipe for crispy onion pakoras through marriage. When she married my father, she learned how to cook Indian food and she’s very good at it. She can make a mean pakora and her chicken curry is out of this world. My mother learned this recipe from my aunt S. who is a phenomenal Indian home cook. I prefer serving this ketchup chutney to serve with the pakoras, buy my grandmother loves eating pakoras with sriracha sauce, which is also lovely. I prefer the Shan brand of chaat masala, which can easily be found at an Indian/Pakistani grocery. 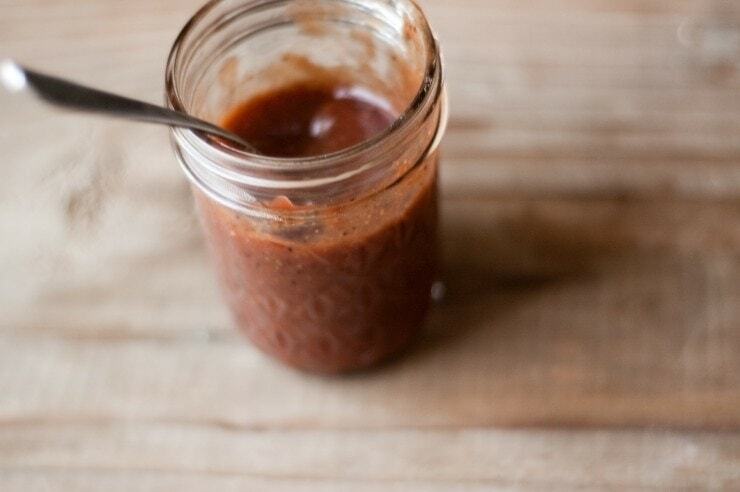 If you can’t find chaat masala, a mixture of ketchup and sriracha sauce tastes just as great. Make the Chutney: Mix all of the chutney ingredients together in a bowl. Fill an 8-inch cast-iron skillet half-way up with oil. Heat the oil to 360-375ºF. In a large bowl, mix together the besan, red chili flakes, salt, baking powder, sliced chilli pepper, cilantro, and sliced onion. Slowly add in the water, while mixing with a wooden spoon or your hands. Vigorously mix for a couple of seconds. The batter should be thick, almost like heavy (double) cream and there should be air bubbles throughout. Once the oil is heated, carefully place in heaping tablespoonfuls of batter into the hot oil. Try not to overcrowd the oil because it will result in greasy pakoras. Fry until the pakoras are a pecan-brown. Drain on a cooling rack placed over a cookie sheet. Repeat with the remainder of the batter. Serve right away, and enjoy. Thanks for sharing this recipe!! I have a bag too sitting here…and seems calling to be made into pakoras! I just got home, hungry, and this is the first thing I see when I sit down at the computer. Dang. Now I’m REALLY hungry. These look so wonderful, and if I’m not mistaken, gluten-free too :). The weather is the same here – doing that dance between spring and winter, today complete with freezing rain and brilliant white snow on the ground. The odd snow in May isn’t unheard of, though it does make things interesting! Also, you’re really coming into your own with the photos Kam. That last one? Absolutely love. Okay, a question (because I really might make these for dinner): when you say red chili flakes, is that the same as crushed red pepper, or something else? This looks so delicious!! I love pakoras and the sauce sounds good – though I love the raisin sauce you sometimes get with pakoras. Yum!! oh God, since Règis and I moved to Asia we have become very acquainted with Indian food (meaning we often go to get our fix at one of the many Indian restaurants in town), the sad thing is I´ve always wanted to give a try and cook this type of food at home but I thought it was too much trouble. However, I think these onion pakoras can be a nice start. I only have one question: if I can´t find gram flour; can I substitute it for other type of flour or is it crucial for flavor and texture?. Hi Heidi, I wouldn’t really substitute as it really would compromise on taste and texture … If you can find dried chickpeas (garbanzo beans), you can make your own chickpea flour (if you’re willing to do a bit more work). To make chickpea flour, you’d need about 3 cups of dried chickpeas and a coffee grinder, a food processor, or a blender. In small batches, simply grind the chickpeas until pulverized and smooth. Run through a sieve to remove any of the large particles and process again, and use as needed. Oh, pakoras…I love them…I usually put more spices in mine, but yours seems great and you know better than me how to make them…I love to eat them with yogurt too, but I have to try your super quick ketchup chutney!! You grew up on these? That is awesome. I suppose onion pakoras are not really six-thirty-in-the-morning food, but if I had a bag of chickpea flour in my kitchen right now, I might just make them so. I too have neglected the chickpea flour in my cabinet. I was going to do something with it months ago, and got freaked out and backed away. Thanks for inspiring me to give it a try. I have never heard of pakoras, they look very good and I think they would have been good with the chicken curry soup I made last night. Hi d.liff – All of the Ingredients are readily available at supermarket/grocery store except for the Chaat Masala, but I did mention that you can easily serve this with sriracha. And as mentioned in an above comment, if you are unable to find chickpea flour (which is usually found in the health foods isle of the grocery store… I use Bob’s Red Mill), you can make your own. As for the preparation, it’s less difficult than even making bread! All you have to do is chop and mix, which I am sure, many people would agree is quite easy. thanks for answering my question Kamran, I think I will have to make my owm chickpea flour. How fun!. I adore your non fussy way of writing and presenting the recipe. No fan fare, nothing-just the recipe and the related clean pictures. It feels genuine and I feel like giving it a try. Onion Pakoras or Bhajiyas, as it is known in some parts of India are a rainy day favourite or quick fix snack ( not that quick fix too). I make them lots of times and use potatoes, Big Green chillies, aubergines, raw banana apart from onions. But whatever you use, this tastes so appetising with a hot cup of tea. I ran through your recipe to see if I was doing it right along or not. Guess, I am not far behind :). But the ketchup chutney is an interesting add. Thanks for showing me something very new to me! Kamran, your pakora are gorgeous. My favourite vendor at my farmers’ market sells pakora that is out of this world but dare I say, your’s look even better and just a touch more rustic. I’ve always had them with a sweet mango chutney and I’m curious about the ketchup chutney. It’s one my daughter will definitely appreciate! Those look amazing! Sign me up right now! Sounds mouthwatering, can’t wait to try this one out, thanks! I love the pictures and the way you describe food. Came across your blog randomly and now I am hunting back through the archives and okay, I think I want to add you to my list of loves at my blog http://presentedbyp.blogspot.com/ … hope you don’t mind. Craving pakora right now and yours look so good. Might have to run to the store tomorrow morning so I can make these for dinner. I love adding chopped potatoes or cauliflower to my batter. My dad is a huge fan of eggplant slices dipped in the batter and fried. I love that there are so many options. can i substitute tandoori masala for chaat masala ?? Lucky- I wouldn’t, as Chaat Masala and Tandoori Masala are two very different spice blends! Love the pakora recipe also done some paneer pakoras and made a dip that was learned in glasgow.250g yoghurt,100g tomato sauce, 15g mint sauce,5g kashmiri chili powder mix all together and place in fridge for half hour add a sqeeze of lemon juice and mix just before seving. Awesome – I love Punjabi food and these are great. Just tried this recipe(first time i have ever made these) and they taste yummy, in fact on par with my mum’s pakoras, so thank you very much. Goes perfect with my dinner planned for my family tonight! Going to make them with spinach too, because my bous love them with more green veggies and dipping them in tamarind chutney! :-) Thank you for sharing your recipe! Just amazing! Served them to my guests on my birthday last weekend and they were a HIT!! Everyone loved them and they came out perfect at the first try. Thank you so very much. Will be frying some more this weekend too. So, I’ve been making these delicious Pakoras ever since I saw this post, and they are much appreciated !!! Now that I’ve started my own little blog adventure, I had to share it as well. Most of the text is in French, but I do give a brief English version at the end. Glad that I surfed for a pakora recipe. I am supposed to be a good cook too (sorry for the immodesty) but your recipe sounds mmmmmm sooooo delicious. Gonna try it TODAY. The reason for looking for a pakora recipe was bcos I ate some delicious fresh potato pakoras from a diner at an Indian supermaket. They were sooo good. I am trying to figure out how they were a perfect golden brown and the potatoes cooked through? I am guessing that the potato strips were seeped in boiling salted water before adding to the batter. What do you think? 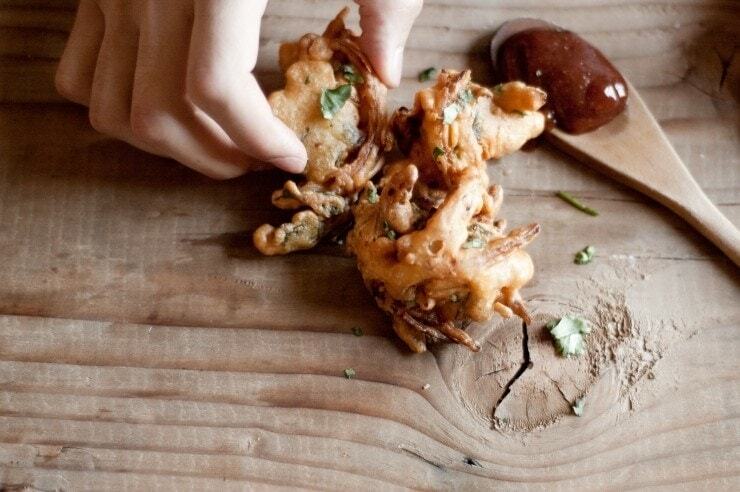 Found your site somehow, Pinterest maybe, and this pakora recipe, and I’m so glad I did! Made them tonight and they were delicious. In fact, that’s all we had for dinner too – stood there at the counter eating them as they cooled. I prefer the mint/garlic/cilantro chutney so I made that instead. Can’t wait to try more things from your blog! Thank you! Can baking powder be substituted with something else? I just finished making these, and, oh my god, are they delicious. I didn’t have and chaat masala OR siracha, so I just mixed some ketchup, chili paste, and cumin, and it tasted great! Thank you so much, I can’t wait to make these again! Thank you these were so darn good! I added parsley and garam masala because I love my pakoras spiced. The ketchup chutney scared me – haha. I made a tamrind chutney instead. 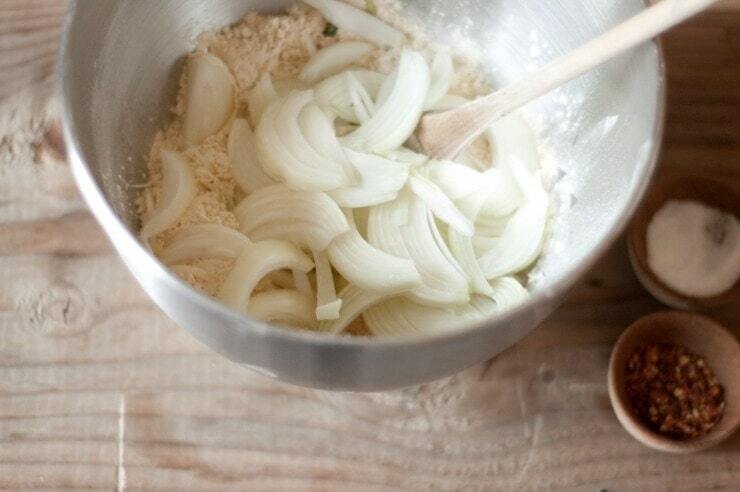 Thanks for the tips- the pic of the onions was useful- more recipes should do that. I have studied Thai cooking quite a lot and am now delving into Indian food. I remember some very delicious onion pakoras I had in an indian restaurant in Langkawi, Malaysia (not to mention some supurb butter chicken I had in Mandalay, Myanmar) in recent years, and I googled your recipe when searching for some guidance, how lucky for me..
the Chaat Masala and Besan, I first tried to find in the local indian food store, but they only had huge sizes of packages.. weirdly enough, I found some right sized pkgs of haat Masala and Besan at the local walmart in Victoria, British Columbia, Canada. So first attempt to far, they were outstanding! as good as the restaurant memory, and not at all hard to prepare, your instructions made it quite easy..
To turn superb into elegant, I would recommend you just find your mom’s or aunties recipe for mint chutney, and post it as the 2nd dipping sauce to be served in conjunction with that excellent ketchup Chaat Massla concoction..
By the way, if your aunty or mom want to show a foreigner like me who appreciates exotic cuisines some of their recipes just let me know and I will be on my way to visit! These look so good. Mom knows best. 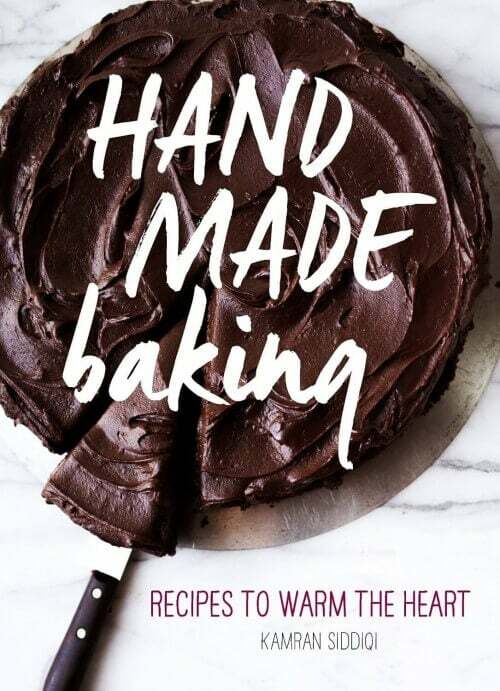 I love your story and how yours got this recipe by way of marriage. So lovely. Me and my husband love Indian food and our kids are learning to like it more. The spicier the better as far as I’m concernd haha! I do try my best at cooking it once in a while so I’ll try this recipe on Saturday. Do you have any other sauce recommendations? I had this for the first time last night. It tastes delicious. We had a sweet & spicy tambrind sauce drizzled over the pakoras. Yummm! These look and sound so delicious. I really could go a bowl of them while sitting in front of the TV watching sport with mates. The easiest and best Cocoa Brownies recipe you’ll ever make.